These days I feel like listing out tributes to influential artists is an all-too-common beginning to my blog posts. 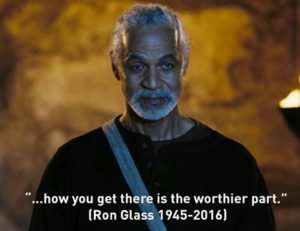 I suppose some might argue at Ron Glass‘ inclusion in this list, but his portrayal of the character Shephard Book in Serenity and Firefly was yet another of Joss Whedon’s brilliant casting moves–Glass was a devout Buddhist who put his money where his mouth was, supporting The Al Wooten Jr. Heritage Center, and adding layers to the words he was given by his mere presence. The quote included in this particular tribute was in response to the question “Why don’t you care where you are going?” It’s interesting to ponder the different levels of that question, as well as what he means with his response. This isn’t at all Alice in Wonderland, where the road you take doesn’t matter. This is recognizing that we can imagine all kinds of destinations, many of which will have nothing to do with the realities we experience, but being true to ourselves on our path makes all the difference. So this week, when we discovered that the daughter of a lifelong friend (who happens to be German) has a wish for a U.S. High School diploma, I started down an entirely different research rabbit hole. I (re)discovered the difference between J1 and F1 visas and will be working on the legalities necessary to help her come live with us next year to make that dream possible. It’s not necessarily anything I would have imagined doing in the past, but part of being true to myself, in this case, is helping a friend who might as well be family. Humans are not equipped to understand our own temporariness; It will never stop being deeply beautiful, deeply confusing, and deeply sad that our lives and our world are so fleeting. We have only these few moments. Luckily, among them there are a few that really matter, and it’s our job to find them. In the meantime, my subconscious has been busy. This morning I had one of those disjointed, somewhat disturbing dreams, that explicitly gave me the titles of a new trilogy of books to begin working on. They would follow the Wytchfire world footsteps and create a space opera series about the power of Dreaming. It’s exciting to be handed an entire series arc, but… I already have so many stories to tell. We’ll see when this one makes it to the top of the list. And I need to finish Red Slaves first. On that front, I made a little progress this week, cutting bits and adding bits to come out about 500 words ahead. I still have 17 pages of notes to go through before I finish that review and can get back to finishing the draft… all of which tells me this book will be longer than I’d thought, too. I expect to be receiving the edited version of the novella this week, too, so there will be another break while I finalize that for its scheduled publication in just over a month. In the future, I will be doing everything possible to avoid having more than one manuscript in train at a time. It wastes too much time switching gears and rediscovering the head-space necessary to flesh out a new world. At least the novel and the novella are both in the same world, with similar stakes, so it’s not quite the wrenching experience it was going from sci-fi (The Builders) to these. I’m also anticipating more editing from Gayla. She’s building a set of short stories, the first of which I’ve already edited, in her Discord Jones world. It’s new characters and new perspectives and ramps up the stakes for everyone in entirely new ways, so I’m excited for all of us to have it join the canon. Whenever both of our lives get out of the way enough to let it happen. Until next week, then, I’ll be checking in with my ROW80 buddies and thinking about how to prepare for a lifestyle change. Wishing you a good writing week, despite travel.